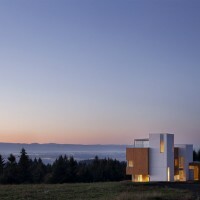 Holst Architecture have designed the Karuna House that overlooks the Willamette Valley in Oregon. Karuna House is an ambitious sustainable design project that was designed to meet a combination of the world’s most demanding green building certifications. 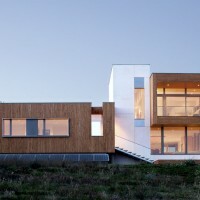 The project is the first MINERGIE-certified home in North America, earning the top rating of MINERGIE-P-ECO. 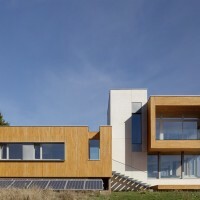 Additionally, it has achieved Passive House PHIUS+, is pending LEED for Homes Platinum, and has reached Net Zero energy use by incorporating onsite solar panels. 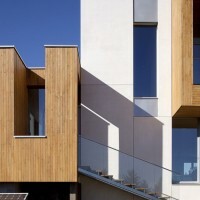 It is expected to be one of the few homes in the world certified by both MINERGIE and Passive House Institute US. 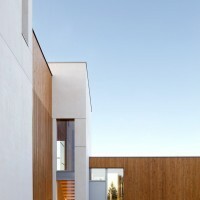 While achieving the environmental sustainability requirements of the project, the home successfully maintains a rigorous form that responds to the client’s programmatic needs. 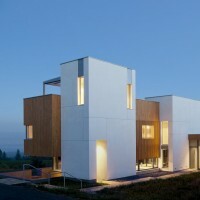 Located on the southern slope of a mountain overlooking the Willamette Valley’s rich wine region, the Karuna House provides spectacular views of the hills and the town of Newberg, Oregon, below. 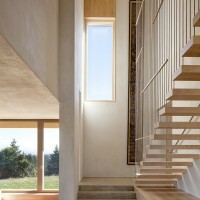 Two towers anchor the Karuna House to the earth, marking the location of double-height spaces and vertical circulation. 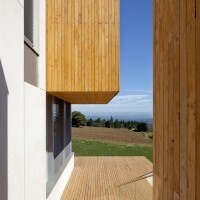 Wood and glass volumes appear to alternately cling to and slide past the towers. These elements contain the living spaces, and are arranged to maximize views to the south and east while graciously separating social spaces from the private and guest spaces. Sited in an area famous for its rust-colored soil, the home’s exterior palette is composed of materials and colors that reflect the tones of its surroundings. The interior finishes cast a warm minimalism saturated in natural light, allowing the owner’s eclectic art collection to take center stage. 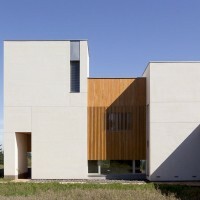 The super-insulated envelope is designed to be airtight. 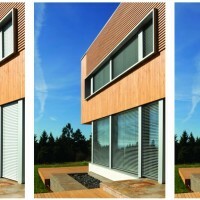 Solar heat gain is controlled through the use of exterior operable blinds that shade triple-glazed wood windows. Heating, cooling, and hot water are supplied by an efficient heat pump system, and a heat recovery ventilator provides the spaces with a continuous supply of fresh, preheated air. 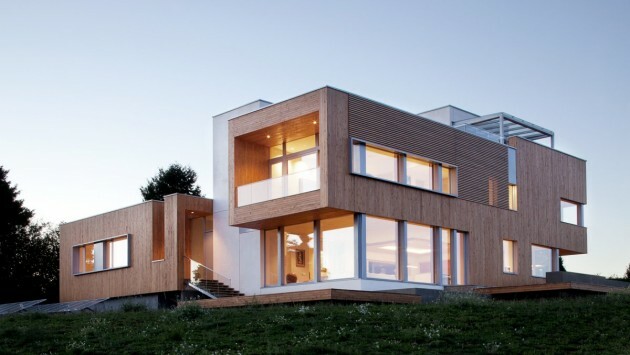 The home’s tight building enclosure is expected to result in the usage of 90% less heating and cooling energy than a typical home. Karuna House’s client, a leading proponent of smart climate policy and sound land use, is pursuing the project as a case study to shed light on the ways that the leading green building certifications and standards complement and/or conflict with one another.